If you’ve been following my blog for a while, you already know about the Christmas gift of the century that Becca and I created last year for her Pappy, PawPaw, and Daddy. I nearly killed myself trying to get it all done in time. So I decided to blog about it starting back in January, and start working on the art work – and give you ideas so that you could create your own calendars with your kids. If you didn’t see the original post, it’s here. Maybe you’ve been working on your amazing artwork all year right along with us, or maybe you’re just now getting started. The beautiful thing is, it’s still August. YOU HAVE TIME. If you haven’t started yet, TODAY is the day! It’s TIME!! If you’ve got your artwork ready, and you’re just waiting for the calendar printout I promised, it’s HERE! Click HERE to download your FREE 2016 printable calendar ready to print out and stick in those calendars. My challenge for myself this year has been that I did a bunch of art with Becca early in the year, and I just flat out haven’t been brave with Grayson really yet. So in the next few weeks, I’m going to bring out some of our favorite art painting techniques and let Grayson try them! So for those of you with Baby Bees, you’re about to see this mama get really brave… It’s Toddler Painting Time in the Hinnant House! My goal is to have enough artwork to make every third month a collage of Grayson’s art. Next year we’ll start in January with both of them and do every other month in the calendar as work from each child. This year Becca will be a lot more involved in making the collages, too. I’m really excited about starting on them – I’ve gotten a few of them started with her over the course of time, but haven’t fully finished any of them. 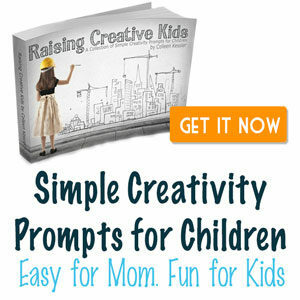 This is such a fun project, and I’m excited about planning an art time into our “school” day each day – for both kids. Plus check back here next Friday for a super fun idea for Toddler Bees AND Big Butterflies that uses those millions of toilet paper rolls you throw away every week!! Author travelwchristyPosted on August 21, 2015 August 19, 2015 Categories Free Printables, Friday Fun with Art Series, Grayson, Holidays - Christmas, Learning Ideas for your Baby Bees Series2 Comments on Calendar Art… It’s Time!! 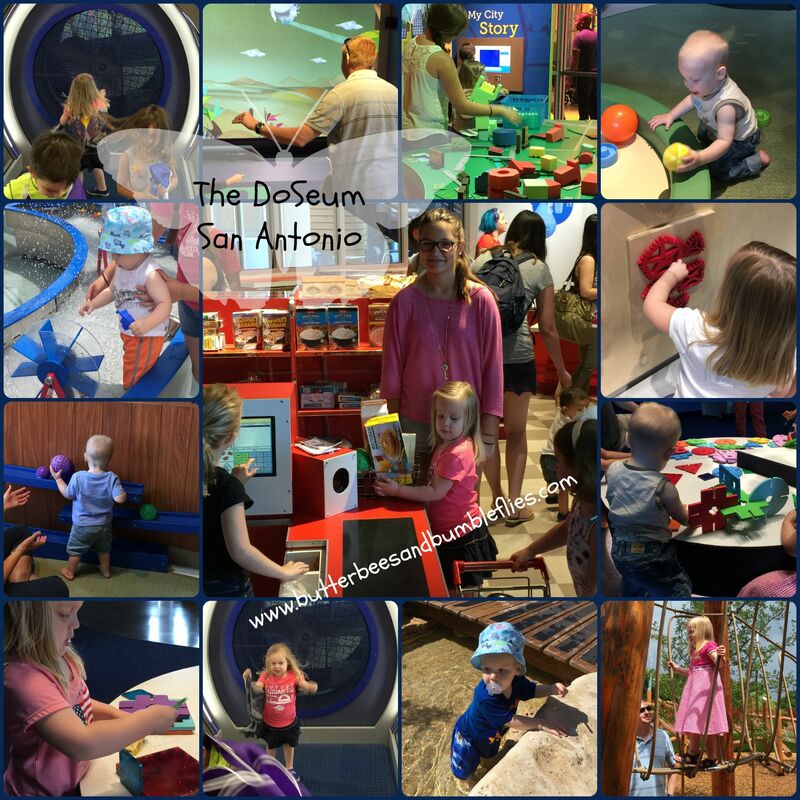 This is not an affiliate post – it’s just the honest opinions of a mom who is an annual member of the DoSeum and has visited on MULTIPLE occasions. This post has been a long time coming… I believe we’ve been to the DoSeum now about ten times. I consider myself to be well educated on the ins and outs… so here goes! We’ll get the negatives out of the way real quick – auto flush toilets in a children’s museum are just a crazily stupid idea. LOTS, maybe even MOST kids are freaked out by auto flush toilets. Bad choice. And then there’s the workability of the exhibits. They’ve been open only since June 1st and in two months time there are already multiple issues with exhibits not functioning properly (for example one of the computer touch screen check-out booths in the Little Town HEB wasn’t working this morning, causing lots of frustration). But that’s it. That’s all I’ve got for you in the way of negatives. So now – for all the things I love love love about the DoSeum! Let me just start with walking in. The funhouse mirrors are just that – super fun. Giggles always start our visit off on the right foot. I love that there are so many different areas for us to explore – I plan our visit each day so that we explore one specific area, but we always enjoy the front – the mirrors, the pulleys, the big interactive video screen, the wind tunnel (Becca LOVES putting on the butterfly wings and “flying”!! ), and the Kaleidoscope. I love that there are lots of tables both inside and out to eat – and that while we have the option of purchasing food, we can bring our own food. (Have I mentioned what a picky eater I’m raising… she thinks that going to the DoSeum MEANS eating peanut butter crackers she’s made herself and fruit packed in her lil lunch box.) Hand washing stations at various heights are readily available as well. There are two huge outside play stations. We have not yet played in the sand (my kids honestly don’t know that area exists b/c I have a thing about sand + water + my car…), but they have really enjoyed the water fountain and little river. They are anxiously awaiting the opening of the giant treehouse (which I think is totally amazing – it’s constructed for handicapped children to be able to join in the play, too with fabulous wide ramps all the way up!!! ), and I know they’ll love playing in there as well. The other outside play station has a giant spider web, log pile, obstacle course that ends in a giant slide, and… a huge water play area. With water wheels and plenty of places to experiment with the various ways that water moves, it’s just a simply amazing out door play space, perfect for any explorer – from just a few months old to the oldest visitors. Which is where I’ll pause – Cody and I LOVED our date night – #ReDoRecess, they called it, or #NightAtTheDoSeum – a night just for kids ages 21+ – where we got to have the run of the place! We had a blast playing all over the place for a couple hours, and are looking forward to the next adults only event! Here we are sitting in one of the incredible outdoor chairs, made from a huge old gnarly tree! There was plenty of room for both of us! Taking a step back inside, we explored the spy academy on our date night, and determined that for older kiddos with an extreme interest in spy stuff, and the attention span to go with it, this is an absolutely incredible area! Perfect for your upper elementary and middle school students, or even older, there are so many activities to do, you could easily spend a couple of hours just inside the spy academy! Becca’s got a couple of favorite areas, but one of them is definitely the little town. When we go with our babysitter, we split up – she follows Becca, and I go with Grayson to the baby area. Then we switch. Because following Becca around is dizzying! I love the fact that there is a DoSeum employee at the entrance to this area, so that if she does happen to get away, she’s not going to go far – she can’t leave that area without an adult. I’ve also been impressed that every time we’ve gone in, the attendant has made an effort to really match us up in his/her mind and also stands next to the strollers and sees which one is ours. Just that little added sense of security that I really appreciate. Inside the little town, everything is on a little kid scale – a fabulous grocery store, a trolley, a bank, a restaurant, vet office, construction site, car wash, post office, and airport complete with a boardable/”flyable” airplane that even has luggage and a “TSA” security station! As a mom, I appreciate all that she learns about the various occupations, and I also appreciate the fact that there are employees and volunteers constantly walking the floor and putting things back in place (esp in the grocery store and restaurant) so that new kids coming to that area can find what they need. I also love love love the garden in the center for babies. It’s gated, and has lots of fun sensory activities on the wall, balls and soft toys to play with, etc. All in all, the little town is fabulous!! At date night we explored the light and sound area. We haven’t taken Becca there yet because of her sensory issues with auditory defensiveness and also her extreme overexcitabilities regarding low lighting. We both had a blast in there, and think she’ll really enjoy the shadow play and light table activities. We’re looking forward to bringing her to one of the sensory evenings that they have for kids with ASD, SPD, and other sensory issues. Get this, parents – they have sensory evenings where they provide headphones/earplugs, sunglasses, and have special signage to warn adults about sensory issues that might be found in certain areas. Lighting is different for these nights (not as dark), and everything caters to our kiddos who have special sensory needs!!! Isn’t that just amazing? It’s finally a museum that truly caters to ALL of our kids! We briefly visited the “Imagine It!” area with Becca, but she wasn’t fond of the sounds there – again, this would be a great place for her on sensory night – but she did go nuts when she saw the room FILLED with books. Pretty sure she would live in that room if she could! She’s also enjoyed using the story starter prompts to tell stories, etc. Definitely so much there for aspiring writers to enjoy!! And ya’ll, that’s just the downstairs!!! Seriously – there’s a whole second story! The engineering section upstairs is just amazing. Places to build with all kinds of different materials, to test out different materials to see how to make them fly, etc. And then there’s what Becca calls the “Ball Room” – where balls shoot through tunnels of air directed by different knobs and levers that the kids can adjust. It can be a super high action, rockin’ place. I chose to stand by the door (it’s a small enclosed space, which is FABULOUS!) so that she can run and explore and always knows exactly where I am. She can’t leave without me, and has a tiny tad of freedom to play til her heart’s content. Also upstairs is a huge social studies area where kids can build mini cities, practice putting a giant foam US puzzle together, learn about energy usage in homes, and explore various info about the continents of our world and view different globes. Did I mention there’s a set of stairs that make noises when you step on them? Oh – and a separate glassed in baby play room that’s just for babies? Impressed doesn’t even begin to cover it. Glad to be annual members? Oh yeah. Ready to plan your visit? Check out their website here: http://www.thedoseum.org You won’t regret it! 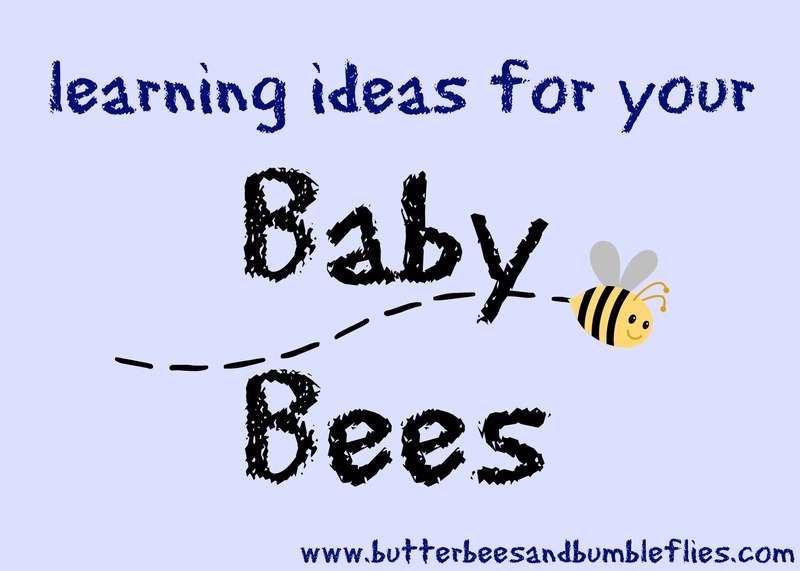 In continuing my series on learning ideas for your Baby Bees… here’s a fun one that your Big Butterflies will be able to enjoy interacting with, as well! 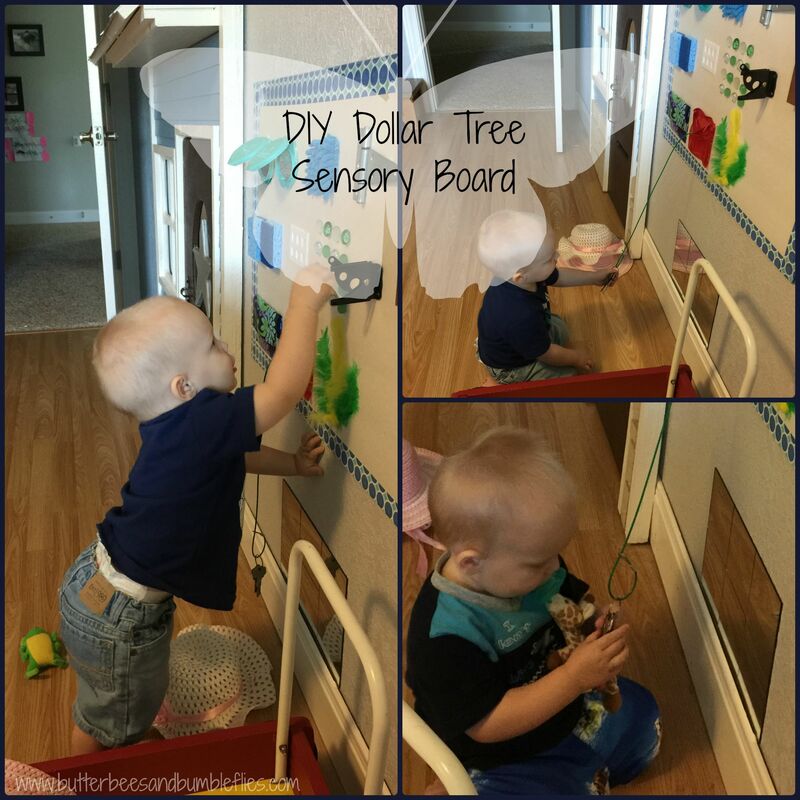 And we’ve found that Sis really loves to show lil Bro how stuff works on his sensory board, so it’s great for all ages, especially if you have kids with Sensory Processing Disorder! I think for me, the most important points were size, usability, and cost. I didn’t want to spend a ton of time and money making something that was going to take a huge amount of space and not be usable for very long. So I looked at all of my pins and found what I liked best about each of the boards. And then began to gather my materials. I was pleased to be able to find most of what I was looking for around the house, and the rest I found at Dollar Tree! I was really pleased to be able to make such a fun board for literally about $5 out of pocket. I found the foam board, patterned duct tape to seal the edges, a two-texture sponge, a car wash rag, and some decorative stones at Dollar Tree. Cody found a few items in his shop for me, and the rest I gathered from inside the house. I used two wipes packet tops, and inside one I glued (used hot glue for everything) some of that foamy shelf liner (soft and bumpy), and inside the other I glued a piece from a metallic bubble wrap envelope (crinkly and shiny). I cut off part of the car wash rag – it’s super soft, and has little “fingers” to run your fingers through. It’s Becca’s favorite aspect of the board. Cody had a gate hinge in the shop that he wasn’t using, so I glued the left side to the board, and put a velcro dot behind the right side, so it will actually hinge open, and makes a cool sound while doing so. A scrap block of wood, also from the shop, makes a great knocking sound, and is hard and smooth. Another item from his shop that the kids love is the gate lock. It’s super fun to lift it up and down and make it rattle. The decorative stones I got from Dollar Tree are great for introducing patterns – both in color and texture, and have been a great way for Becca to learn the difference in see-through and opaque. A piece of a plastic sink drain mat is fun to rub your fingers across, because not only does it have little bumps all over it, it also has little square openings that allow you to feel the foam board backdrop as well. The sponge is fun to play with – I just cut it in half, and was able to allow the kids to play with both sides – smooth and scratchy. And of course, since it’s a sponge, it’s fun to punch, push, and press. I threw on some feathers for good measure, and then two pouches: one that zips, and one that is velcro. The velcro pouch has ten large pretend “gold doubloons” left over from Becca’s first birthday party ages ago, and the zipper pouch is super fun because I took a piece of cording Cody had in the shop, and hot glued it inside with a ring of keys attached! So Gray can practice opening the zipper, taking the keys out, play, and then put them back in and zip it up! I seriously spent about $5 on this board. Then found a good height in our family room and nailed it to the wall. Super simple, basic… nothing fancy or expensive. Nothing too time consuming to make. Yes, it took a little planning and forethought, but I can see this board being something they play with for the next couple of years – even though Becca is older, it’s fabulous for her need for proprioceptive input (SPD)… and when they are done, if it’s still in good shape, I can pass it along to a friend with young kids who can put it to more good use. If not, I throw it in the trash and know that I got more than my money’s worth! 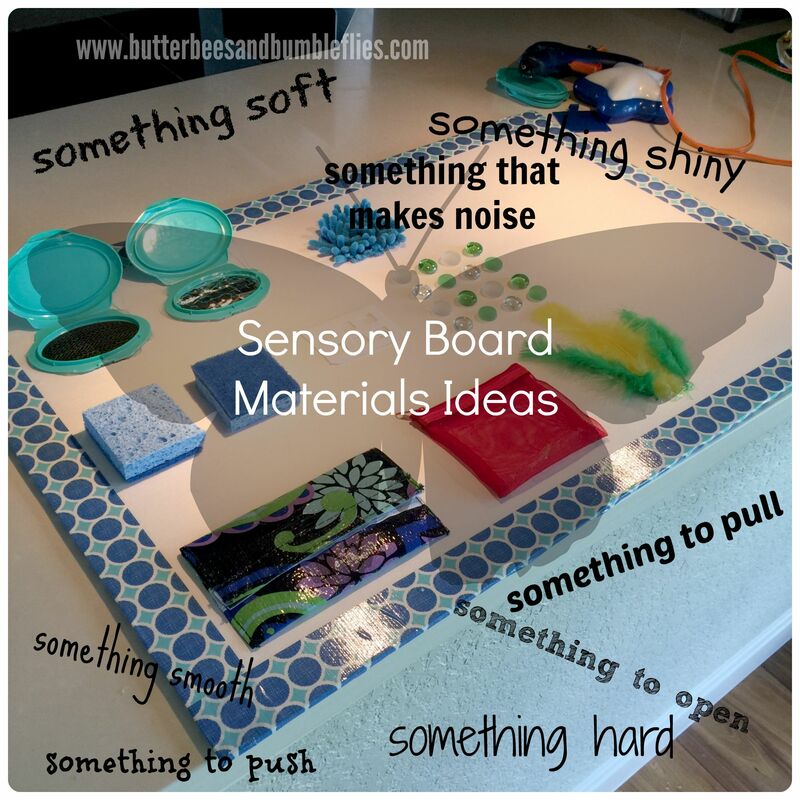 Have you created a sensory board for your Baby Bees/SPD Adventurers? I’d love to see your ideas and add them to my pin board for others! Please share links in the comments!! 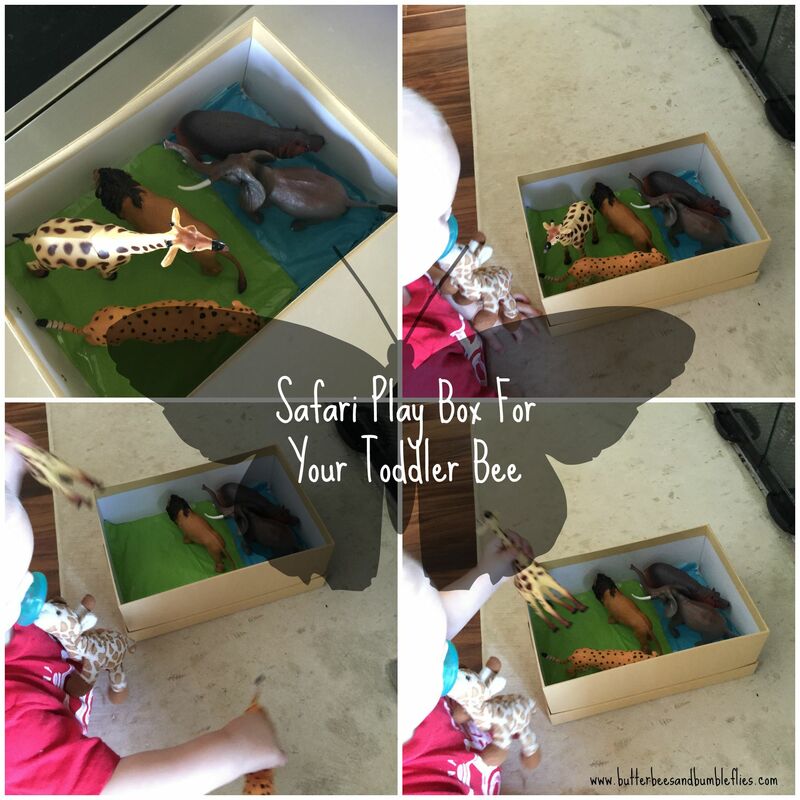 Did you see yesterday’s post about Grayson’s new animal play boxes? Well, I couldn’t share that post without sharing this with you. Especially if you are a first time mom… or a first time mom of a boy… or both. I love both of my kiddos dearly. But I knew going into this whole parenthood adventure that boys and girls learn very differently. I can totally relate to how Becca learns, because it’s similar to how I learn. But I must say that Grayson, while his style sometimes stretches me, is a lot more close to my love for adventure. The kid likes to explore. He likes to get down and dirty. If there’s a way, he’ll find that way and make it happen. He’s a mover and a shaker… and a BIG mess maker. 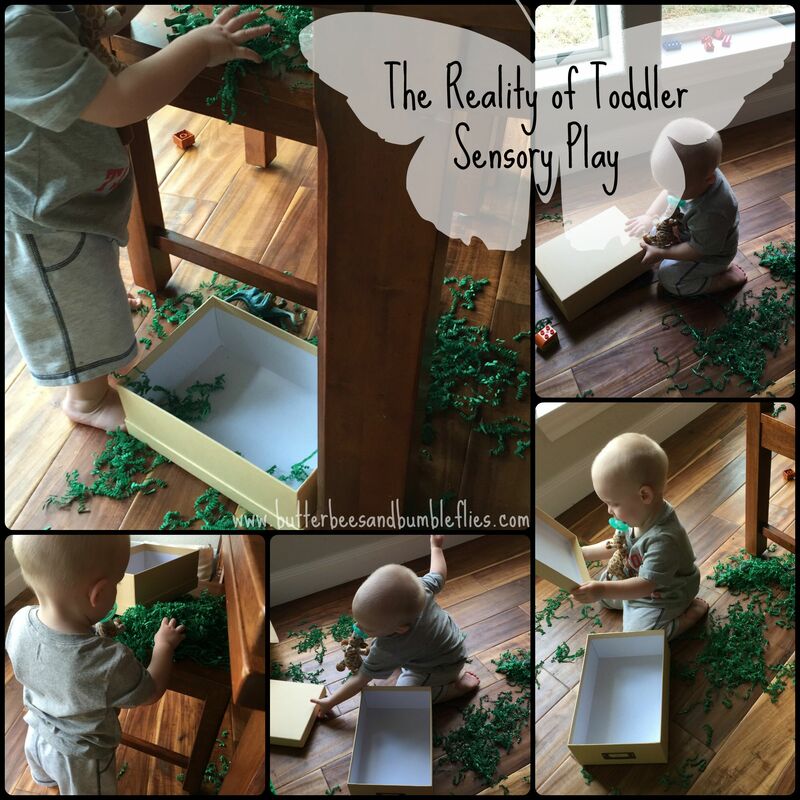 So while you might have a child who can do sensory play relatively mess free, as a parent you need to just get prepared for the messes. Messes like this used to bother me. That’s why I’m sharing this. Because I want you to realize all that he learned from this exploration. 1) He explored sound and discovered that the paper doesn’t make much noise when it hits the floor, but the box is loud. 2) He figured out how to get the box lid off of the bottom of the box, and then practiced his fine and gross motor skills by attempting to put the lid back on the top. 3) He discovered that he doesn’t like the way the paper feels when it gets stuck to the bottom of his foot. 4) He practiced taking handfuls of the grass out of the box, and putting it back in. 5) Perhaps the most important lesson was the one he learned when he was all done and had been playing elsewhere for quite a while. I called him over to me to help me clean up. He is currently in his 61st week of life – halfway through the “wonder week” leap called “Principles.” This is the time when his brain is finally learning how to follow rules… and he is starting to test out – what happens when I don’t obey? As a mom, this time period is hard on me. Becca was really really tough through this phase. Grayson is sometimes easier and sometimes more difficult – just depending on the moment. He doesn’t like to clean up. But, he does love getting praise (and he loves to clap for himself when he’s done something right!). So, the cleanup required me to actually physically go and get him, and bring him over to the box. I picked up most the grass and put it in, and had him put in the last handful. Then he put each of the three dinosaurs into the box, and put the lid on top. I encouraged him, bragging on what a good job he did to follow directions! He was so excited that he did a good job and got that verbal praise and the literal pat on the back and hand clap. That was a hugely important lesson. The next day, when I called him over to help clean up, he didn’t come when called, but I brought him over and did the same thing, and didn’t even have to tell him to pick up the dinosaurs – he did it on his own. Not sure what brain development has occurred for your child at their current age? I HIGHLY recommend checking out the website/book/app with brain research by Drs. van de Rijt and Plooij. It’s good stuff! CLICK HERE TO VISIT THE WONDER WEEKS FOR MORE INFO! All of this to say, learning is a messy undertaking. Sometimes messier than others. But it’s fun, and it’s important that kids not only be allowed to make messes, but taught to take responsibility in cleaning up their messes from and early age. A 14 month old is ready to start cleaning up after himself – brain research proves it. 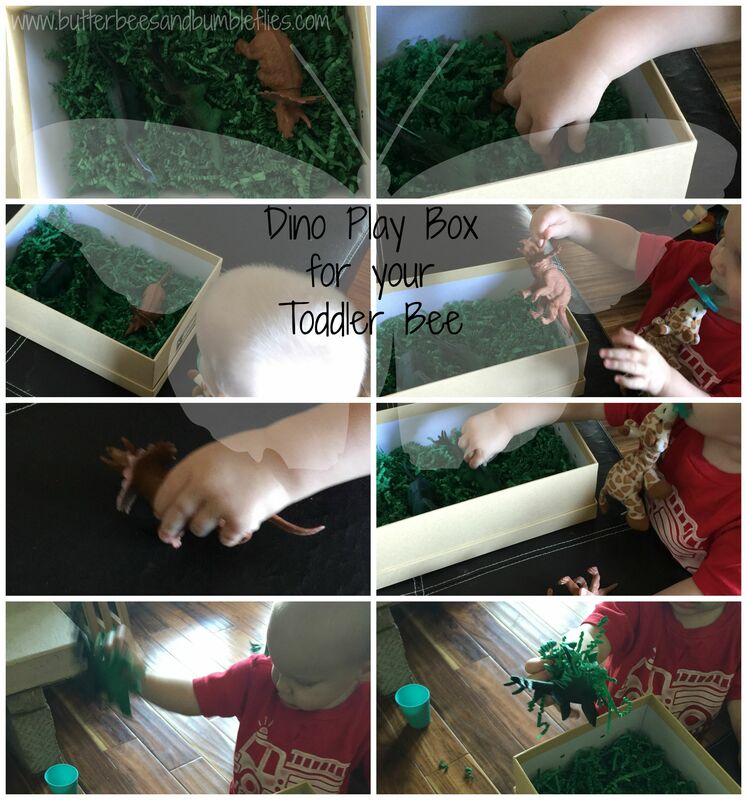 Start allowing your Baby Bees to explore, and start requiring them to help clean up, too! Cleaning can be a super fun game and a great way to teach the concepts of “in” and “out” and “up” and “down”, as well as what is trash and what isn’t. You might feel like your baby is still a baby, but when their brain is ready, start giving them appropriate challenges – it’ll pay off in spades down the road. Curious about the chores our Big Butterfly does around the house to help? Check out this post that I did with the Recipe for a Successful Homemaker (of either gender). How do your kids (of all ages) help around the house to clean up after themselves and other family members?